The operation couldn’t be performed because object ‘EXCHANGE\First Storage Group\Mailbox Store (EXCHANGE)’ couldn’t be found on ‘DC.domain.local’. A most inventive and amusing title to this post, if I do say so myself! Mailbox database “EXCHANGE\First Storage Group\Mailbox Store (EXCHANGE)” doesn’t exist. 1. 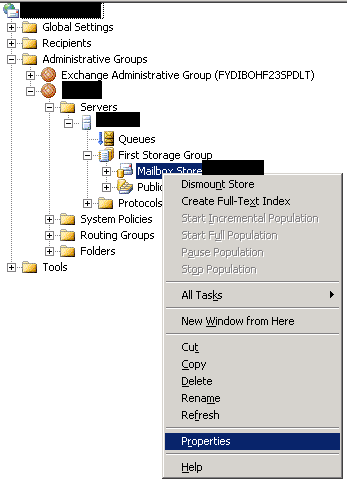 Log into your Exchange 2003 server and open the Exchange System Manager (affectionately known as ESM). 3. Go to the Security Tab of the Mailbox Store and select the Advanced option. Tick the box to ‘Allow inheritable permissions’ , and Apply your changes. 4. If this doesn’t fix your problem, or if the ‘Allow inheritable permissions’ box is already ticked, then do the same thing (Advanced settings under the Security tab, make sure the ‘Allow inheritable permissions’ box is ticked) but to do this, go into the Properties of the server itself, not the Mailbox Store. 5. If even this doesn’t work, then you should manually add in the Exchange 2010 server into the permissions group for the Exchange 2003 server and give it Full Control.